An animatronic band bangs out Sinatra, and the title character hammers out Mendelssohn on an organ in the peerless The Abominable Dr. Phibes. (Definitely check out our our 10 Memorable Horror Movie Musical Numbers). Director Robert Fuest (heretofore best known for the Emily Brontë adaptation Wuthering Heights) creates a little bit of magic on a budget, fashioning a lovely, sumptuous looking film that’s deceptively cheap if you examine it too closely. 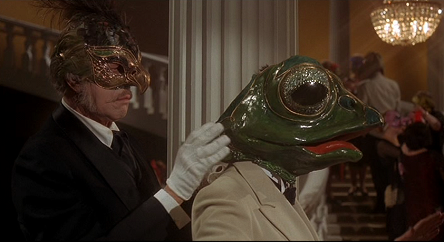 And there’s a compelling story to boot: Phibes survives a horrible car crash, with his face hideously scarred. This is soon after the good doctor’s wife succumbs to an illness after nine surgeons try and save her. 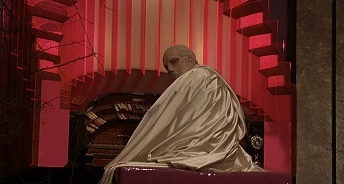 The mad Phibes is an evil renaissance man character who’s spawned imitators, both the obvious (Phantom of the Paradise) and the not-so-obvious (Saw — Jigsaw’s hidden key). This entry was posted in Black comedy and tagged 70s movies, Comedy horror, movies and music by Really Awful Movies. Bookmark the permalink.